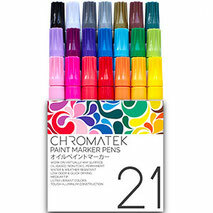 Professional art supplies made for artists, hobbyists and children alike. Perfect for adult coloring books, children's coloring books, arts and crafts, doodling, gift cards, greeting cards, scrap books, party invites and thousands of other creative projects. Chromatek art supplies are manufactured to the highest standards using the most vivid archival style inks & paints available. 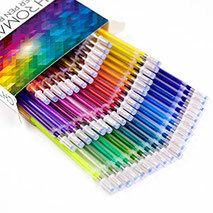 We've made some of the best art supplies in the world. We are super proud of them and we know you're going to love them. If, for any reason at all, you need to return your goods you are absolutely 100% protected by our 30 DAY MONEY BACK GUARANTEE. Log into your Amazon account, locate your order and organize a FREE and EASY return from there. If there is anything else you need help with, we are here for you, drop us a line here: Contact. 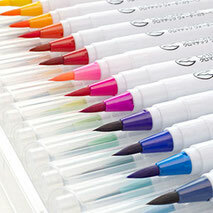 We make art supplies because we love creating, whether it be coloring, painting, drawing, sculpting, you name it. You love art too (or this is definitely not the right site for you). We'd love to see the wonderful work you create with your new art tools. We'd also love to hear what you think about our products, what you love about them of course, but also any suggestions for ways you think we could improve or pen sets you'd like to see us produce. We've already made the best pen sets we have ever used but we’re constantly striving for perfection. Drop us a line any time and we'll get back to you as soon as we can. Art serves many functions, creating it can be meditative, cathartic, relaxing or deeply fulfilling. But sometimes it can seem out of reach, and creating beautiful art can seem like it is the exclusive preserve of professional artists. Learning can seem like a insurmountable challenge and frustration or disappointment can sometimes make it seem more like work than fun. We are here to challenge that notion. 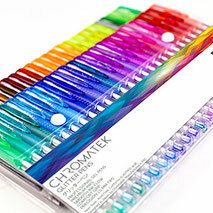 We created Chromatek not just to provide you with the best art supplies, we are dedicated to making creativity in all mediums more ACCESSIBLE. 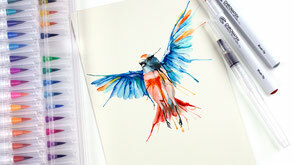 Our videos and tutorials will gently guide you through using your new art supplies and help you get the absolute most from them. While we can’t promise to remove all the frustration from learning new techniques we’ve done our best to make it a hugely fun and rewarding process and provided helpful tips to avoid many of the major pitfalls along the way. More people than ever are discovering their artistic side, for the first time or returning to it as a hobby. There can be something deeply relaxing about creating art, whether you like to listen to music while you color or sit in the quiet painting, the world around you fades away and quite often your stresses with it. We are passionate about art but the products available on the market quite often do not match that passion. On one hand over priced professional artists tools and on the other cheap and poorly manufactured equipment that is not designed to last. Our artists tools have been born out of the love of that focused flow state where creativity meets stress relief and out of a need for well made and fairly priced professional art supplies. 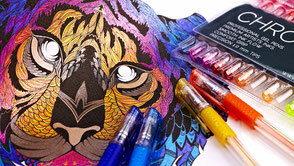 Our pen sets are the result of years of art and design experience. Each set is unique and extensively researched and tested to bring together the very best new colors in complimentary groupings. They designed to give you exactly the right degree of variety and breadth of color so that no matter which set you buy you will be able to produce a huge range of results without getting bored. Our micron archival style inks and professional paints and dyes are created using the most vivid commercially available colors and produce stunning results, please do check the gallery and videos for examples. Sets can be combined indefinitely to produce an infinite degree of different results. 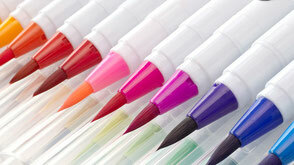 All of our pens are precision manufactured to the highest degree, are non toxic and conform to all US safety standards. We're sure you'll enjoy using them as much as we do.